Angels are known for taking care of us foolish mortals. We're always putting ourselves in troubles way. Imagine how hard it is to watch over an animal who thinks it's acceptable to skydive, go spelunking, and feed sharks from a tiny cage dangling in the ocean! This dark angel is the one that shows up when we need to hear hard truths. 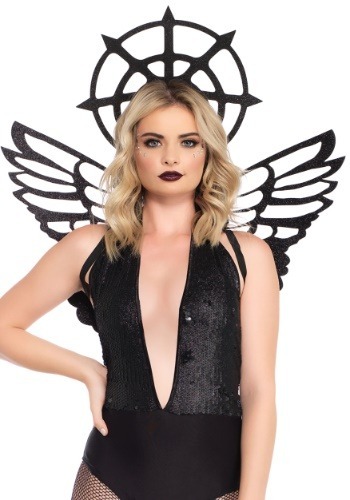 This black dark angel kit comes with cut out black wings that strap to your shoulders, remaining secure as you move throughout the night. The black halo will be a real show stopper, creating a unique three-dimensional silhouette that's sure to stand out in photos! This angel might be dark but she has your back. She'll land in front of you and smash your smartphone under her heal before you wander while texting into traffic. She'll go online and cancel that flight to go visit your ex in one last attempt to get back together. She'll even take those extra spicy burrito leftovers from your fridge before you get back after a long night out, though we're not sure if that's cause she's hungry or if she's watching out for your digestion. Dark angels are allowed to take liberties. Salute your dark guardian angel at your next costumed even with this gorgeous costume kit!